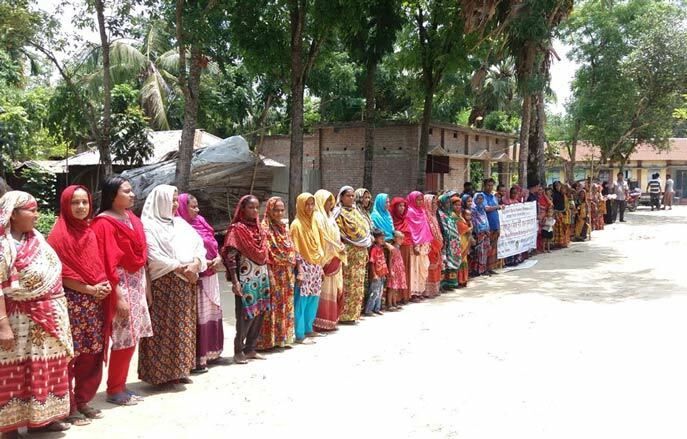 Over 500 Farmers from 18 villages in Delduar Upazilla in Tangail and Atghoria Upazilla in Pabna in two separate events held today (20 May, 2017) at 10 am. In Tangail it was held in Silimpur Bazar, Pathrail Union, Delduar and in Pabna, rally was held in village Tong Boira, Chandbha Union, Atghoria Upazilla. 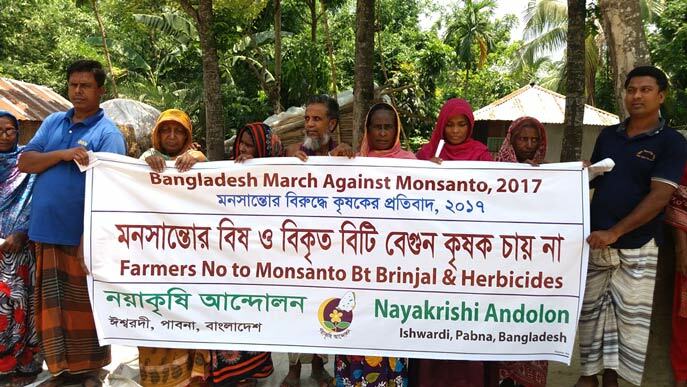 These rallies were organised by UBINIG and Nayakrishi Andolon on the occasion of the Global MarchAgainst Monsanto, 2017. There were women and men chanting slogans against the aggression of the corporations like Monsanto into their local seeds and against poisoning of our food system. It was a hot summer morning, yet the farmers held the rally with great enthusiasm and determination. Farmers started the rally with songs, particularly a song by Akkas Ali on the activities of Monsanto. Nayakrishi farmers are practising ecological farming, they are more known as biodiversity-based farming practitioners. Women are taking lead in preserving local varieties rice, vegetables, pulses, oilseeds, fruits and other indigenous crops. So they chanted slogans for keeping the local variety seeds and also against the genetically modified seeds. Bt Brinjal was a major concern in both the areas. 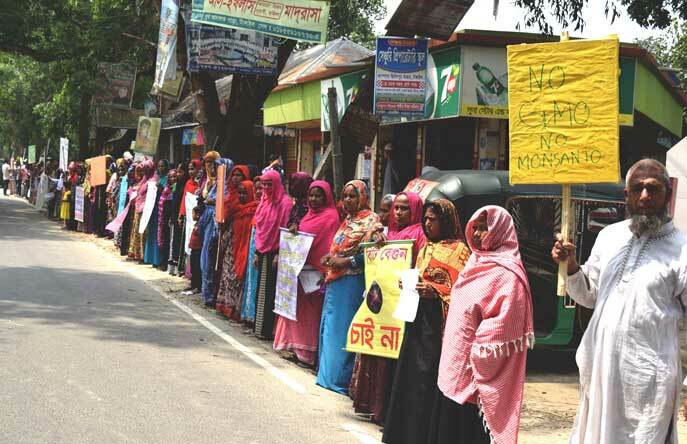 In Pabna, the rally was held in a village where a farmer, Nazrul Islam, was given Bt Brinjal seeds two years back, but he did not cultivate it again. Local people reported that he incurred loss in the crop. Farmers chanted slogans that “we will not cultivate Bt Brinjal”, “we will preserve local variety brinjals”. The farmers are concerned about the genetic intervention threatening the foundation of Bangladesh agriculture. 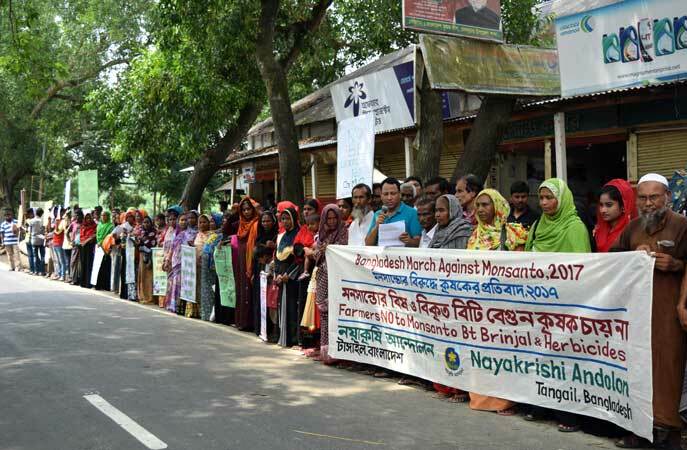 Farmers demanded justice against the damages caused by Monsanto as violation of their rights to preserve seeds and to grow crops of their own choice. Moreover, Monsanto herbicides damage soil and environment and also are threats to human health health.